librarian | "In good writing, WORDS BECOME ONE with things." 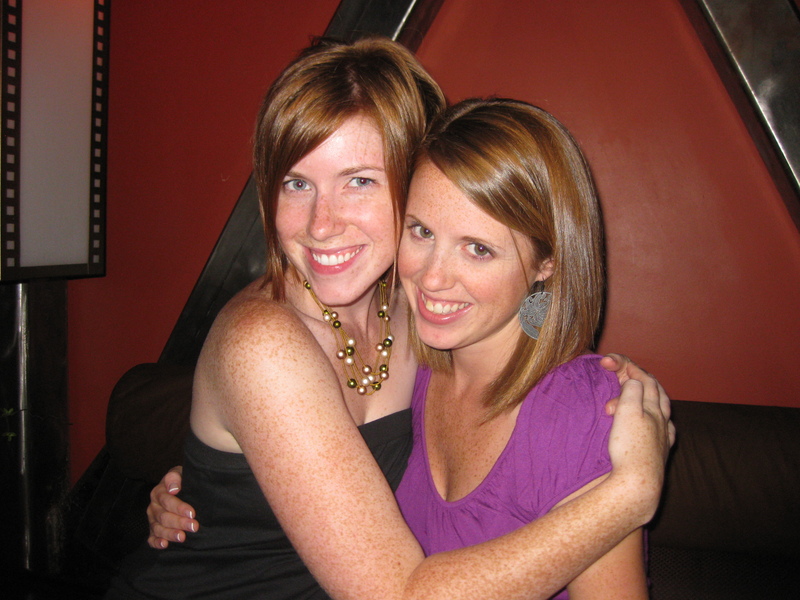 Please welcome my newest guest blogger, Amy Hofmann. Amy lives and works in Philadelphia, PA at Penn Wood Middle School where she inspires seventh and eighth graders with her brilliance as a librarian. She has a dry sense of humor, likes a good beer, and is a proud member of the redheaded population (see photo at bottom of article). Amy and I met as neighbors in Lancaster, PA shortly before I moved to Seattle. We have been friends for almost 13 years, despite 12 of them being spent on opposite sides of the country. Here she shares her shocking entry into life as an inner-city school librarian. Names, except Amy’s, have been changed. Fact: The Philadelphia school system is one of the worst in the nation. The Southwest region, in particular, contains some of the poorest schools in a largely failing district. The statistics on school violence, poverty, inept teachers and failing students are vast. True or False: Fresh out of graduating with a degree in library science, I got a job in the Southwest region Philadelphia school system. Answer: Undeniably, this is very, very true. Allow me to regale you with some of my real life experiences working in the trenches. I started work at Harrity in early February of 2009. I walked in the first day and was promptly told that I would have to pick up the 7th graders from the playground and bring them to their classroom to teach them, since the library was being used by a second grade whose classroom had flooded a few weeks before. Sure, that makes sense: teach library and research skills in a classroom where there are no books, encyclopedias or computers to support the lessons. So I made my way up to the third floor with 30 children who were, for the most part, much larger than me and most definitely more street smart than me. We tolerated each other pretty well, until one of them walked himself out of the classroom. I followed, telling him to come back in. He turned around. “I’m Ms. Hofmann, the new librarian, why don’t you come on back into the classroom?” I replied. “Pshhh.” He looked me up and down. “I give you….hmmmmm….two weeks.” And he was gone. Flash forward to the end of March. I have regained control of the use of my library, it’s a Friday afternoon, and I once again have the 7th grade giants (I say giants because I’m now teaching in a school with real, age-appropriate 7th graders. I’ve concluded that I was actually teaching 17-year-old 7th graders at Harrity.). The next thing I knew large, wooden chairs were flying through the air, tables were being pushed up against the book shelves and a full fledged girl-fight had erupted. I quickly ran to my phone to call the office– where of course, no one picked up. After three frantic calls with no response I grabbed my cell phone and called 911, shaking the whole time. Finally, our lone security officer arrived with a principal in tow. As soon as they showed, I hung up on 911 and ran to the aid of a teacher who’d tried to break up the melee and found herself sliding face first across the carpet and missing a shoe. Administration lined the students up and then called for more principals (we had three). Then they personally escorted each student out of the building and off of school grounds. Meanwhile, I was shaking and 911 was still calling me back asking me about my emergency. You’d think that the large-and-in-charge 7th graders would be the worst of my problems. If only that were true. Instead, the biggest thorn in my side came in the form of one of the smallest children in the school. Saif Halston was the fastest, sneakiest, and one of the smartest third graders in the school. The first day I taught his class he decided he wanted nothing to do with the reading of How to Eat Fried Worms and decided instead to clean out his desk. I responded by removing his desk from his reach. Of course, this display of authority made him really happy, so he got up and ran out of the room. I thought that was a problem. Turns out getting him to leave when I wanted him to was even harder. His class was one of the worst in the school and constantly spent their library period running around the room, crawling under tables and generally wreaking havoc. Saif often terrorized me by refusing to leave when his class’s time was (finally) up each day, choosing instead to climb up the book shelves and run around the perimeter of the library on top of them. Reread that last sentence and then think back to your experiences in a library. That’s right. I spied Saif’s silent little brother, a kindergartner, and also probably the most precious thing in the world to Saif, taking in the insanity from a corner. I walked up to him, held out my hand and said, “Come with me.” He said nothing, but reached his tiny little hand up to mine. We headed out the door. “GET YOUR HANDS OFF MY LITTLE BROTHER!! !” I heard Saif shout. Victory was mine. Saif was off the tables and out the door after me faster than I thought possible. I quickly released Kumar’s hand and ran back in the library, pulling the locked door quickly shut behind me. They slammed their bodies into it a few times, but eventually tired of it and went home. This was my real life, folks. My “normal” day-to-day. I had resorted to kidnapping small children in order to get what I wanted. Saif spent most of his time at school “running the halls.” Because of this, he was often suspended from school for breaking the rules. However, because he was, at age 8, pretty much solely responsible for his 5 year old brother, he came to school every day anyway, to drop him off. Then he’d sneak into the building and hide out for a while until the halls cleared and then would start running around again, causing chaos in just about every classroom. Eventually, the administration realized that Saif’s daily runs were actually a problem. Since he was pretty much the fastest creature on Earth, they came to the decision that instead of wasting their time trying to catch him, they would send the 7th graders who had a penchant for wandering out after him. Besides, those boys could pick him up and sling him over their shoulders, kicking and screaming, without fear of a lawsuit against them. I guess he wanted to make sure I’d never forget him.